NC and CNC metal cutting machines are among the most popular machine tools in the business today, There is also a strong trend toward using flexible machining centers and flexible manufacturing systems. The same trend is apparent in gear cutting. Currently the trend toward CNC tools has increased, and sophisticated controls and peripheral equipment for gear cutting machines are now available; however, the investment in a CNC gear machine has to be justified on the basis of economic facts as well as technical advantages. A high-performance, 11-axis CNC system from NUM has enabled machine tool manufacturer Sicmat to create a gear honing machine that sets a new industry standard for post-hardening fine finishing. 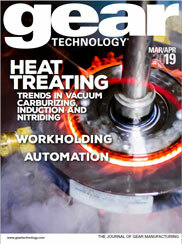 Grinding in one form or another has been used for more than 50 years to correct distortions in gears caused by the high temperatures and quenching techniques associated with hardening. Grinding improves the lead, involute and spacing characteristics. This makes the gear capable of carrying the high loads and running at the high pitch line velocities required by today's most demanding applications. Gears that must meet or exceed the accuracy requirements specified by AGMA Quality 10-11 or DIN Class 6-7 must be ground or hard finished after hear treatment. Multiple CAM initiatives at Snyder Industries are improving safety, quality and productivity for parts ranging from 50 to 5,000 lbs. Metrology is a vital component of gear manufacturing. Recent changes in this area, due in large part to the advent of computers, are highlighted in this article by comparison with more traditional methods. Contrary to what appears to be popular belief, 5-axis CNC gear manufacturing is not limited to milling with end mill, ball mill or CoSIMT (Conical Side Milling Tool — it is the generic form of the Sandvik InvoMill and Gleason UpGear tools.) tools, where throughput is too low to prevent production at any significant level. Straight and spiral bevel gear manufacturing on 5-axis CNC machines using face mill cutters provides essentially the same throughput as conventional gear cutting machines — with added benefits. Question: We just received permission to purchase our first CNC gear inspection system. With capital approvals so hard to come by, especially for inspection equipment, I want to be sure to purchase a system I can count of for years to come. My past experience with purchasing CNC equipment has shown me that serviceability of the computer and the CNC controller portion of the system can be a problem in just a few years because of the obsolescence factor. What information do I need to look for when selecting a supplier to reduce the risk of obsolescence, as well as to reduce the long-term servicing costs in the computer and controls portion of the system? Traditionally, profile and lead inspections have been indispensable portions of a standard inspection of an involute gear. This also holds true for the worm of a worm gear drive (Ref. 1). But the inspection of the profile and the lead is rarely performed on a worm wheel. One of the main reasons is our inability to make good definitions of these two elements (profile and lead) for the worm wheel. Several researchers have proposed methods for profile and lead inspections of a worm wheel using CNC machines or regular involute and lead inspections of a worm wheel using CNC machines or regular involute measuring machines. Hu and Pennell measured a worm wheel's profile in an "involute" section and the lead on the "pitch" cylinder (Ref. 2). This method is applicable to a convolute helicoid worm drive with a crossing angle of 90 degrees because the wheel profile in one of the offset axial planes is rectilinear. This straight profile generates an involute on the generated worm wheel. Unfortunately, because of the hob oversize, the crossing angle between the hob and the worm wheel always deviates from 90 degrees by the swivel angle. Thus, this method can be implemented only approximately by ignoring the swivel angle. Another shortcoming of this method is that there is only one profile and one lead on each flank. If the scanned points deviated from this curve, it produced unreal profile deviation. Octrue discussed profile inspection using a profile checking machine (Ref. 3). The goal of gear drive design is to transit power and motion with constant angular velocity. Current trends in gear drive design require greater load carrying capacity and increased service life in smaller, quieter, more efficient gearboxes. Generally, these goals are met by specifying more accurate gears. This, combined with the availability of user-friendly CNC gear grinding equipment, has increased the use of ground gears. A reader wants to know: Are profile ground and hobbed globoidal worm sets better than multi-axis CNC generated globoidal worm gear sets for reduction of noise and vibration? RCD Engineering's switch from manual to CNC hobbing operations breaks gear manufacturing lead time records with Bourn & Koch 100H in their gear production pit crew. Back around 2005-2010, the most exciting things that were happening in broaching had little to do with broaching. What was happening - and continues to evolve today - was the emergence of on-the-edge CNC, software and servo drive technology. Together, they practically transformed a metalworking process as old as water into a viable, alternative consideration for producing high-volume part runs. Okay. You've been convinced. You've gritted your teeth and decided to spend the money to launch a company Web site. Everybody from your teenage propeller-head to the girl in the mail room and the salesman in the flashy suit who gave you "such a deal" on Web site services has promised that your site will be the best thing that's happened to your business since the advent of CNC machines. The modern day requirement for precision finished hobbed gears, coupled with the high accuracy characteristics of modern CNC hobbing machines, demands high tool accuracy. This paper presents a new approach in roll testing technology of spiral bevel and hypoid gear sets on a CNC roll tester applying analytical tools, such as vibration noise and single-flank testing technology. You're already a veteran of the computer revolution. Only you and your controller know how much money you've spent and only your spouse knows how many sleepless nights you've had in the last ten years trying to carve out a place in the brave new world of computerized gear manufacturing. PC's, CNCs, CAD, CAM, DNC, SPC, CMM: You've got a whole bowl of alphabet soup out there on the shop floor. Overall these machines have lived up to their promises. Production time is down, quality is up. You have fewer scrapped parts and better, more efficient machine usage. It isn't for everyone, but... Within the installed base of modern CNC gear profile grinding machines (approximately 542 machines worldwide), grinding from the solid isn't frequent, but a growing number of gear profile grinder users are applying it successfully using CBN-plated wheels. DTR offers a complete line of coarse pitch to fine pitch hobs including involute, worm, chain sprocket, timing pulley, serration, parallel spline or special tooth shape, shaper cutters and milling cutters for auto, aerospace, wind, mining, construction and other industrial gear cutting applications. EXCEL-LENT gear design software can optimize rack and pinion, spur, helical, internal, external, and circular pitch gears in English or metric units. Our gear/gear box design software quickly determines product parameters for various applications saving HUNDREDS of engineering hours. Helios Gear Products from Koepfer America offers machines and tools for gear manufacturers. The company continues to exclusively represent Koepfer models 160, 200, and 300 CNC gear hobbing equipment and also legacy Koepfer models. In addition, Helios products include the latest CNC machines for gear hobbing, shaping, grinding, milling, inspection, deburring, chamfering, and automation. The Helios brand also represents gear cutting tools and tools for hard finishing. Klingelnberg is a world leader in the development, manufacture and sale of gear production machinery and related equipment. 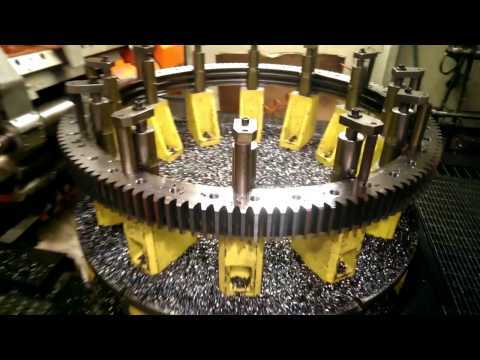 The Klingelnberg Group is a world leader in the development, manufacture and sale of machines for bevel gear and cylindrical gear production, measuring centers for gearing and axially symmetrical components as well as customized high-precision gear components. Penta Gear Metrology LLC, a builder of special machines and automated systems for over 50 years, offers the ND430 Next Dimension® Gear Measurement System. The Next Dimension® has been designed with the latest in motion control technology. Shenzhen Gearshine Precision Machine Co. Ltd. The Gearshine Co. was founded in 1985 and since then, we have devoted our efforts in the design and manufacturing mostly of worms and worm set gear drives. Excel Gear engineers have over 50 yrs of experience in machine tool design, gearbox design and manufacturing, wind turbine gearbox, gear manufacturing, analysis and testing of gears, high speed spindles, CNC gimbal heads and attachments. Our qualified engineers can assist in virtually any phase of your project, however complex. Stock Drive Products/Sterling Instrument provides complete motion control and power transmission solutions. Over 100,000 inch & metric components are available off-the-shelf for fast turn around. When a standard part won&#039;t meet your requirements we can provide alternative solutions through custom design and manufacturing. Call our engineering group about your application. WD bearing is a technology-oriented group company, specialized in R&D, manufacturing, sales and service of high quality bearings. In order to make WD as a symbol of quality, WD keeps investing in advanced CNC equipment and comprehensive precision inspection devices. We commit ourselves to building a high quality employee team and bringing in advanced technique of manufacturing and management from USA, Europe and Japan.